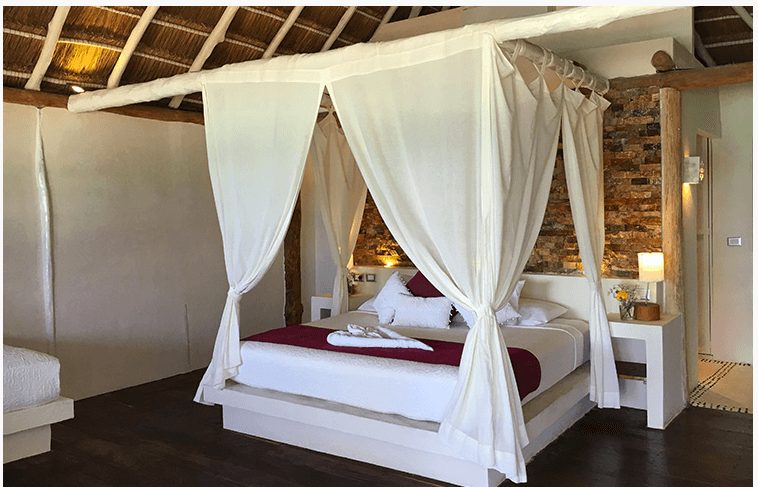 This post aims to offer you a comprehensive guide to the best hotels in Tulum beach. I have seen many of them and I know how tedious can be to decide where to stay in Tulum where the hotel offer is broad and diverse, each property with its own personality and character. 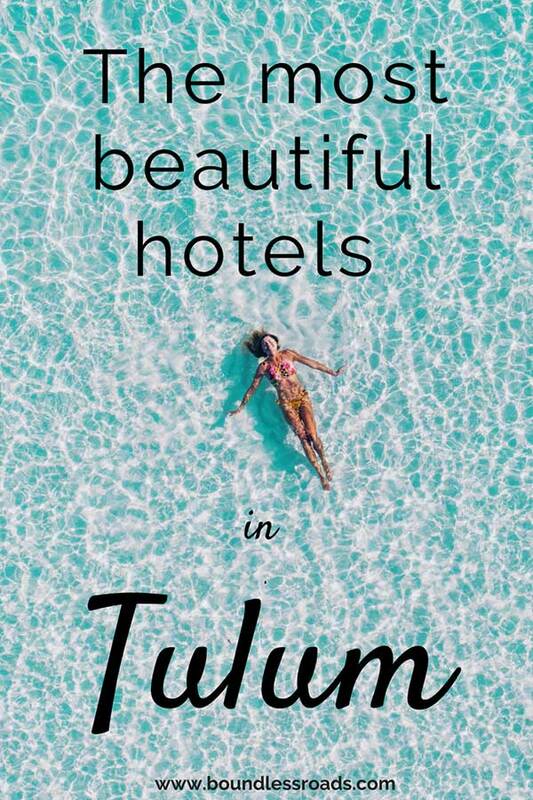 Whether you are looking for where to stay in Tulum on the beach or in town, here you will find the best option that I have found in my detailed research on the best places to stay in Tulum. It was a pleasure for me visiting all the different hotels and appreciate their whimsical pieces of furniture and warm service. As the offer is so huge I couldn’t really see them all. 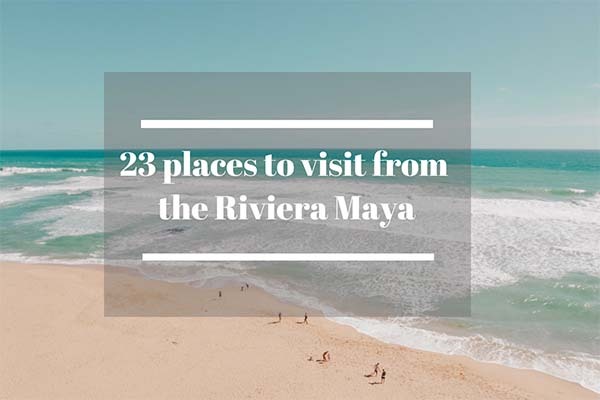 Here, I have selected a few for you, according to my taste and I have classified them by category and location so as to make it easier for you to browse and chose your favorite place in Tulum. Before moving forward I just wanted to give you the heads up if you are looking for all inclusive hotels in Tulum, these are not easy to find and not the best option anyway. In fact, both in the beach area and in downtown Tulum, there is a huge variety of restaurants of all sorts, and you don’t really want to consume all your meal in the same place. Part of the Tulum experience is also about the different dining options available. You can check out my guide of the best restaurants in Tulum, the coolest spot and cafe’, here. The beach in Tulum is for sure the best area to stay in Tulum if you want to live the Tulum lifestyle, even though the downtown area has its own charm, I admit. 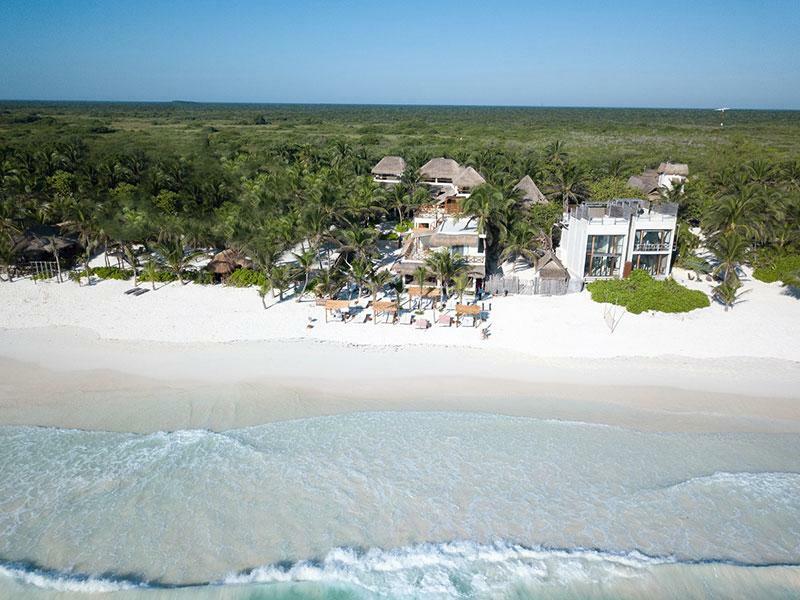 In this section, you will find all the best Tulum luxury hotels in the beach area. One of the new additions among the most popular hipster hotels in Tulum, right on a stunning stretch of beach and the pristine Caribbean turquoise waters. The new boutique hotel boasts a unique design which superbly merges the simplicity of the natural elements with comfort and elegance, creating a beautiful oasis of bliss and tranquillity for their guest to enjoy and restore. Each one of the spacious rooms has a unique personality and some of them are located right by the sea offering stunning soothing views. I am happy to announce that the hotel offers a special 10% discount to Boundless Roads readers who book through their website. Follow this link and insert the promo code BOUNDLESS10 where requested, insert the dates of your stay and click on apply underneath the code. Enjoy your stay and let me know how right I was!! Azulik Eco-resort and Spa is the hit of the moment, the best place to stay in Tulum, and I have a feeling it is set to last for a good while, at least for the sophisticated travelers in search of an exclusive unique hotel. Its unique unrivaled style, besides its serious Instagram potentials, is paired with exceptional views of the turquoise beach and a topnotch restaurant menu. Among its features, it’s an adults-only beach resort and Mayan Wellness Centre. The rooms are bohemian wooden tree houses whose minimal decorations are made from Mexican royal ebony Khatalosh. The beach is private for the guest only and has a clothing-optional choice. Among the top luxury hotels in Tulum, Be Tulum is the one that most epitomizes the Luxury Lifestyle. A magnificent blend of jungle style and sophisticated interior. It’s one of those places that makes you feel cool and fancy even in your worse day. Impeccable service and private pools are among the guest favorites. Among the best places to stay on Tulum beach, Casa Malca is definitely among my favorites. Owned and designed by the New York Art Collector Lio Malca, whose important projects have included the launch of retrospectives at New York’s Whitney Museum, it’s no surprise in seeing such elegance and taste enclosed in the 41 rooms hotel. The architects managed to merge different worlds, contemporary art with an overwhelming jungle, an outstanding beach and the finest amenities, all in front of a sweeping turquoise sea. Nomade Hotel in Tulum is a stunning creative hotel that boasts a multicultural architecture in an elegant style. You will be mesmerized by the beauty of every little detail of your room, not to mention the sophisticated restaurant with international flavors presented in artistically-prepared dishes. A special focus is given to vegan cuisine and healthy leaving, although no worries, your favorite cocktails will be served all day and night. If I am being honest this is one of my favorite spots in Tulum. Something has to do with the special “vibes”, a special energy that you feel when you are there which adds up to the indisputable beauty of the rooms, the attention to every detail and the delicate taste in every aspect of the decorations and service. Not to mention the delicious cuisine that skilfully mixes the Italian traditions with Mexican flavors. A new fancy property with minimalistic architecture; essentially chic, it gives a relaxing and sophisticated atmosphere. One of its main features is the refined gourmet vegan menu and the best yoga space ever, overlooking the stunning beach of Tulum; an ideal place to take care of yourself, both inside and out. 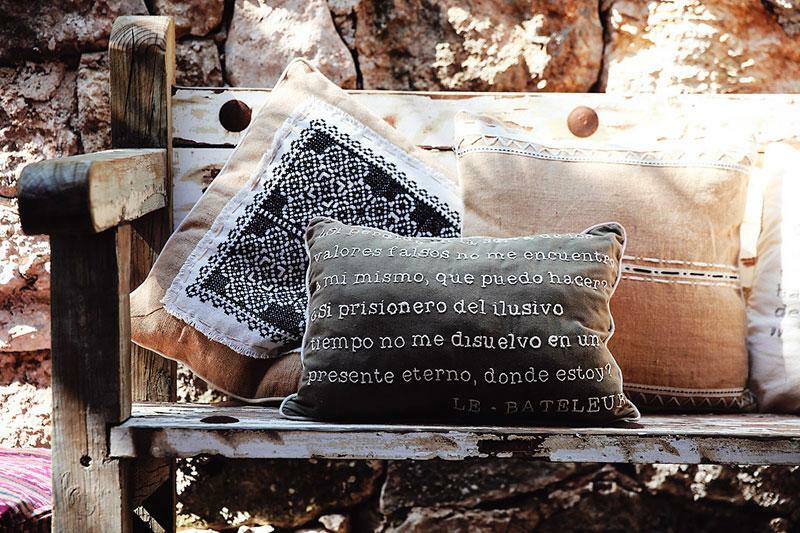 I fell in love with Nest Tulum just by browsing through their website. Their creativity merges modern architecture with local vintage pieces, lending a cozy and yet elegant appearance to the atmosphere. 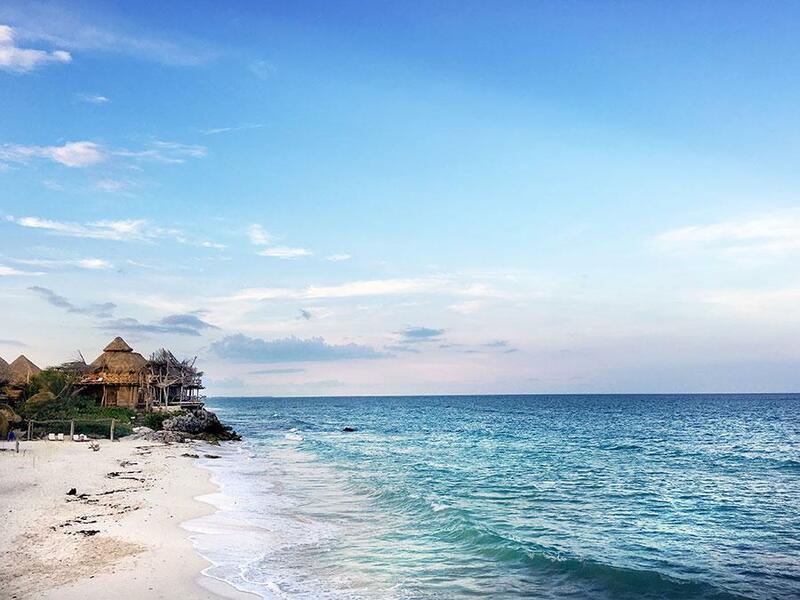 A blissful place from where you can enjoy the immensity of the worldly Tulum Beach. 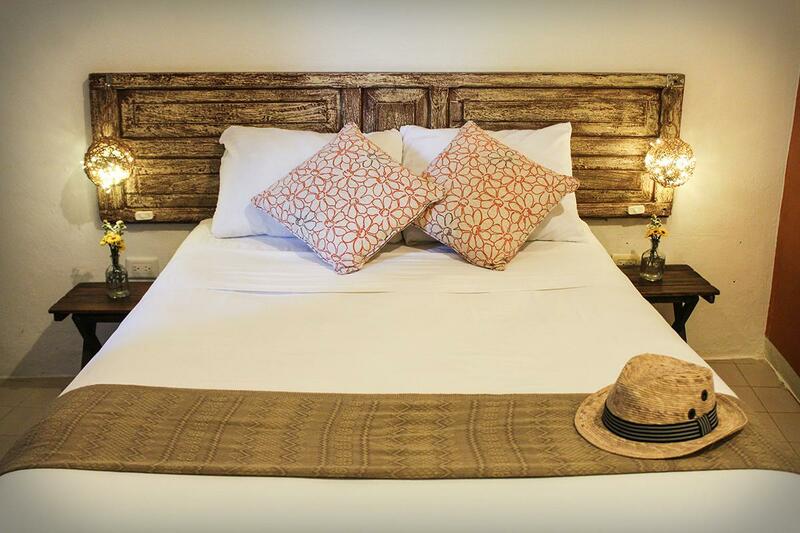 Zamas Tulum is a romantic boutique hotel that will make you fall in love. 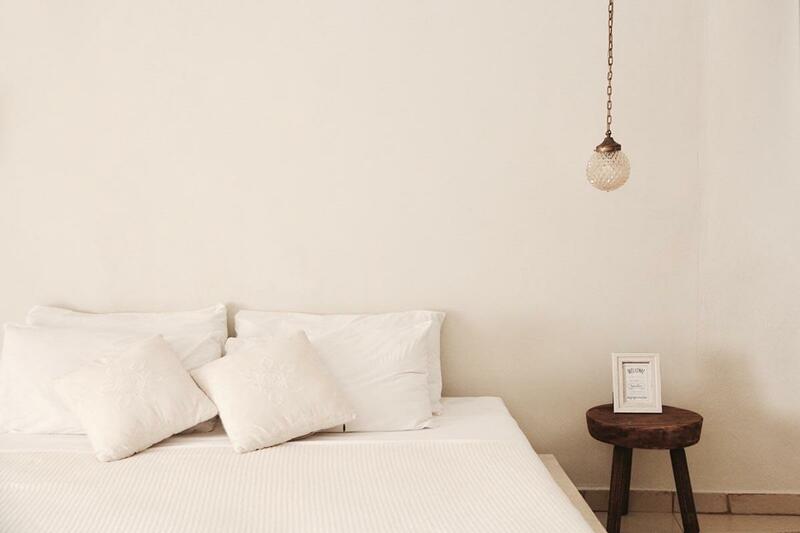 The cozy rooms combine the simplicity of the raw polished cement with natural elements such as wood and decorative plants and pieces of local art and textiles as decorative details. The result is an elegant space where you can relax and enjoy the peace and tranquillity of the surrounding jungle and the sparkling sea. Some rooms are located just in front of the water right on the white sand. A relatively new property, cozy and elegant with a fully air-conditioned and great restaurant. The ceviche is the best! 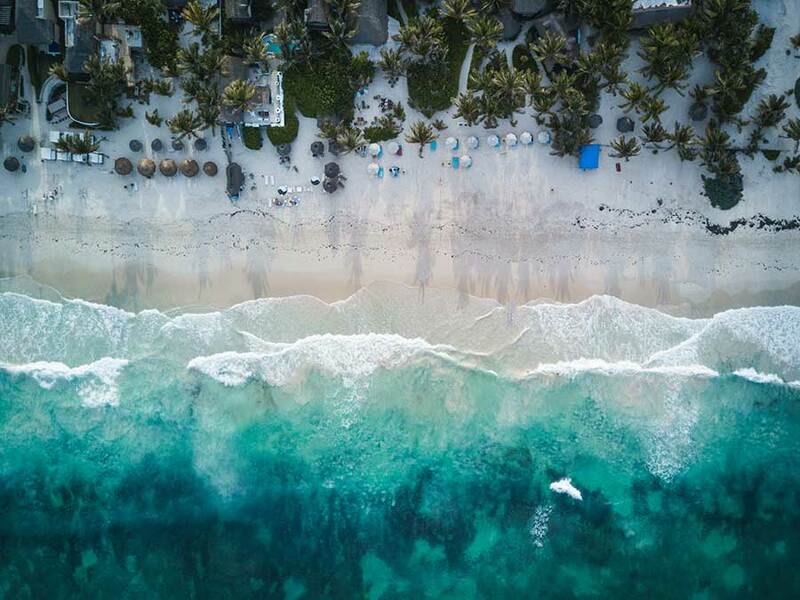 An iconic and timeless venue on the beach of Tulum, it has become the hip place, frequented by the boho crowds from New York City and Los Angeles. It is mainly popular for their Italian restaurant but I also love the decor of the rooms and the general vibes. Note: the featured picture is courtesy of Nomade Tulum. The good news is you don’t need to spend a fortune to find a hotel in the best part of Tulum to stay in. It is true that the majority of the hotels have outrageously high rates, especially in the high seasons, much higher than any other hotels of the same category and comfort in another destination. That is because Tulum grew its own reputation as a trendy cool destination where the raw material and vintage decoration have become the new luxury and fake cheap as I call it. Therefore few hotels offer to stay on the beach at a decent price, but I have found some for your and here they are. 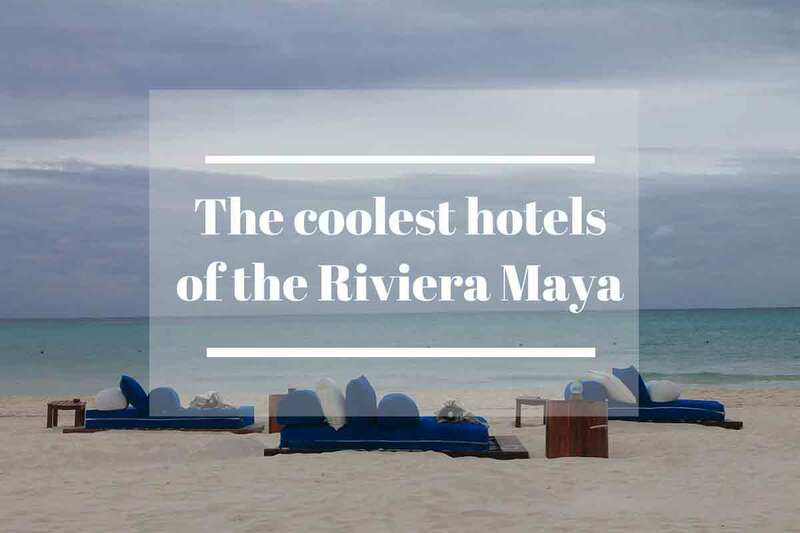 This little jewel is a great option for your stay on the beach in Tulum. The beautiful individually decorated cabins are located in a tidy garden surrounded by palm trees and facing the blue sea. They include safe and mosquito nets. Very important. This is an eco-friendly property that uses ecological sources of energy. The Mivida restaurant specialized in tapas has amazing reviews not only for the delicious specialties but also for exceptional service and view. However, you can find also great options for restaurants at a walking distance from the property. The eclectic architecture, blending Balinese doors with local wooden furniture, stone walls, and fine accessories, makes this hotel one of the best romantic hideaways. It’s located on a lovely stretch of beaches a little far from the heart of the Tulum beach life, but close to the Tulum Archeological site. This is one of my favorites where I spend my day on the beach every time I go to Tulum. You will have the typical palapa roofs and includes hammocks and comfortable lounge chairs on the beach area. The rooms are spacious elegantly furnished and with either a beach or garden views. There is a restaurant on the beach that serves local and international cuisine. Of course, this list is not exhaustive at all, as there are so many options that it’s impossible for me to visit them all. However, I have made a selection for you by filtering by guests reviews and beach properties. Here you can find the insider tips on the best hotels in Tulum town. There is, in fact, another side of Tulum, which is the Down Town area. It’s about 10 km from the beach (7 miles) but still really cool and offer a more affordable Tulum stay without losing the charm. Many more fancy restaurants and hip hotels are opening far from the beach either in the heart of town or a little more secluded in the surrounding jungle, that is even more appealing. Here I am offering some options. 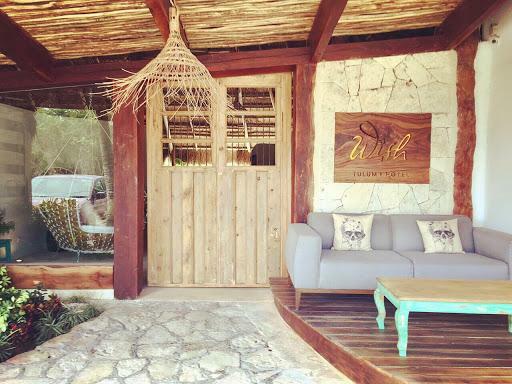 There are many cool places to stay in Tulum downtown and Howlita is one of them. 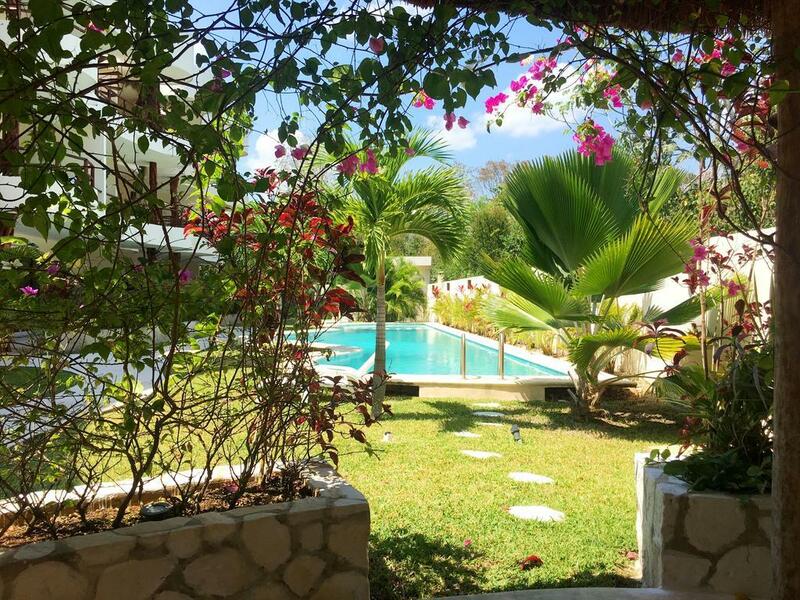 Located in the heart of downtown Tulum, this little gem is the perfect solution for a budget vacation in style. The beautifully decorated rooms with fine finishings, great wifi connection are everything you wish for a pleasant stay. The location is at a walking distance from all the trendy bars and restaurants and the lovely pool is exactly what you need to finish your day chilling. Breakfast is also included. 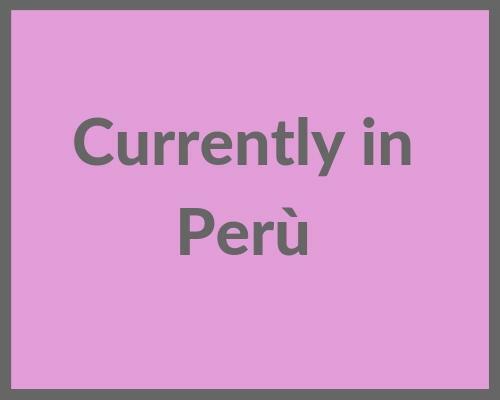 Situated at the beginning of downtown on the way to Boca Paila, the hotel zone, Prana is a cute little property suitable for couples and family alike. The comfortable and spacious rooms are finely decorated in wooden and turquoise color evoking the stunning color of the ocean. The delicious breakfast, included in your rate is served in the cozy restaurant by the pool, in the internal garden. Everything is looked after in every single detail, including the exceptional service. Among the services included you also have WIFI and bicycles. It is indeed a secret garden, literally. As soon as you enter the wooden door, you get into a different world. The cute spacious rooms surround the main patio, an open-air living room, with gravel floor and wooden sofas’ among secular trees and bright green plants. The 8 recently renovated bedrooms are minimalists and yet very comfortable and practical, besides being nicely decorated. WIFI throughout the whole property and breakfast included in the morning served in the restaurant. Another great option for your stay in downtown Tulum and live like a local. 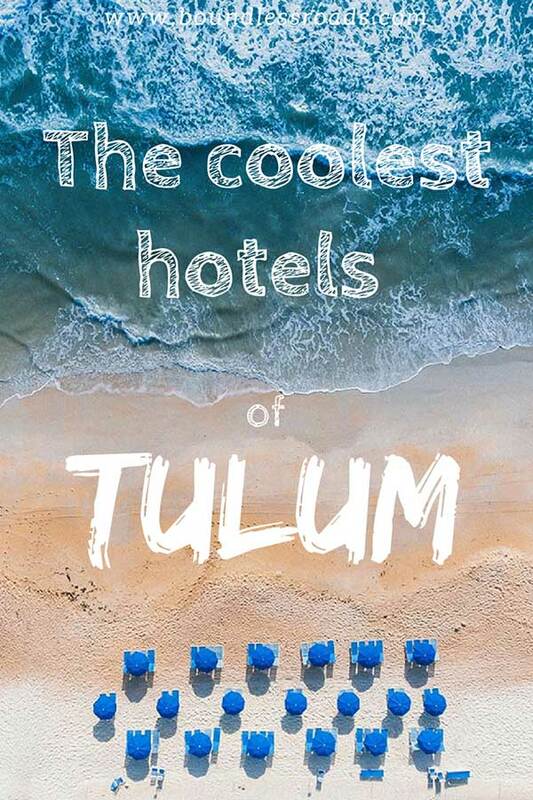 Among the best hotels to stay in Tulum downtown, wish Tulum is among the newest. And a artsy addition that definitely deserves mentioning. Typical Tulum style, showing the finest creativity to make your stay magical. The vintage decorated rooms are spacious and comfortable, the big swimming pool offers a great option to the already wonderful beach. The fantastic location ad a few km from the archaeological site and downtown and a few extra km to the beach, which you can reach by bike, offered by the hotel at a minimal cost. Such a beautiful oasis in the middle of downtown, I would call it simple luxury tents in a spectacular garden. The tents feature a queen-size bed, cotton linen, a fan and each one is decorated with a different theme, from Africa to Italian or local, each of them with their own en-suite bathroom. There is a Yoga Centre with daily morning and afternoon classes. They also have a restaurant, Flow, that serves vegetables from the on-site Permaculture farm, homemade yogurt and kombucha ( very healthy and purifying local drink). There are a swimming pool and tanning deck with lounge beds and sun chairs next to the common living room. The new kids in the block, or in the Jungle I should say, Holistika couldn’t choose a better name for itself. 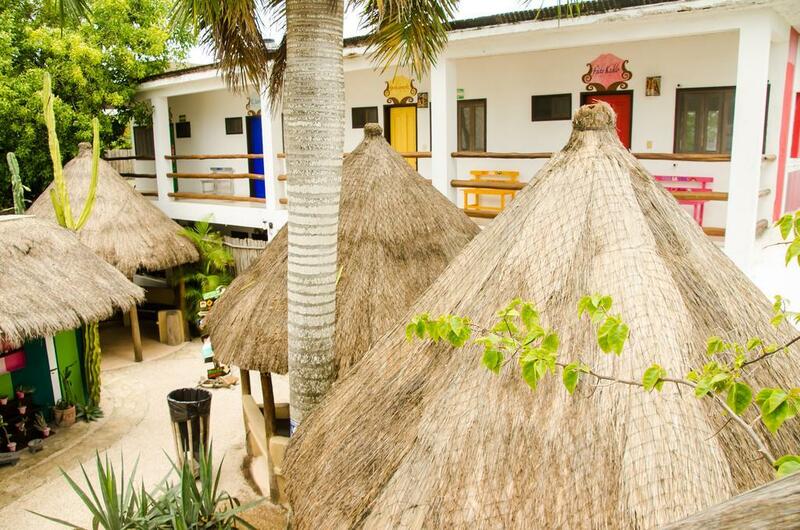 The original hotel located right in the jungle outside downtown Tulum boasts Jungle style modern accommodations, budget dorm rooms or pretty private rooms, decorated with the Oh-so-chic! vintage-minimal style. But this is not it, Tierra is their popular vegetarian restaurant attracting all the healthy clientele of Tulum and surrounding, and a Yoga saloon is available for rejuvenating yoga classes, and so many Instagrammable corners throughout the entire photogenic place. Definitely, a place that deserves attention during your Tulum vacation. 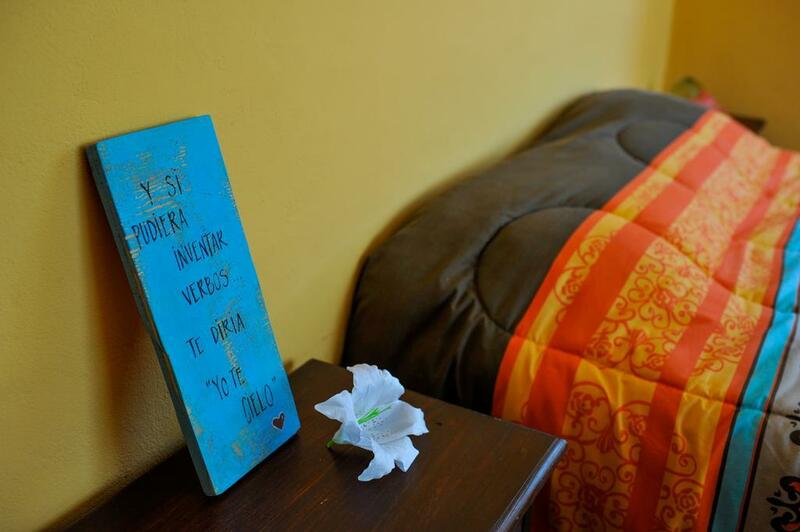 A cute little property for a comfortable stay at a budget. The lovely rooms are beautifully decorated each one with a different pattern, al facing a well-kept garden. Located at a few minutes from downtown and close to the main road that takes you to the beach, which is at about 3 km distance. Strategically located in downtown on the way to the beach and to Coba, the beautifully decorated rooms are dedicated to the Mexican Icons Frida Kalo to Speedy Gonzales, the Virgin of Guadalupe and so forth. The creativity of the owners merges Mexican and Italian style: the results is a cozy and very familiar atmosphere In a great location close to everything. Make sure you read through the property details and understand what is included and what is not. Remember also that taxes (or a portion of them) are always added up once you are at the property. 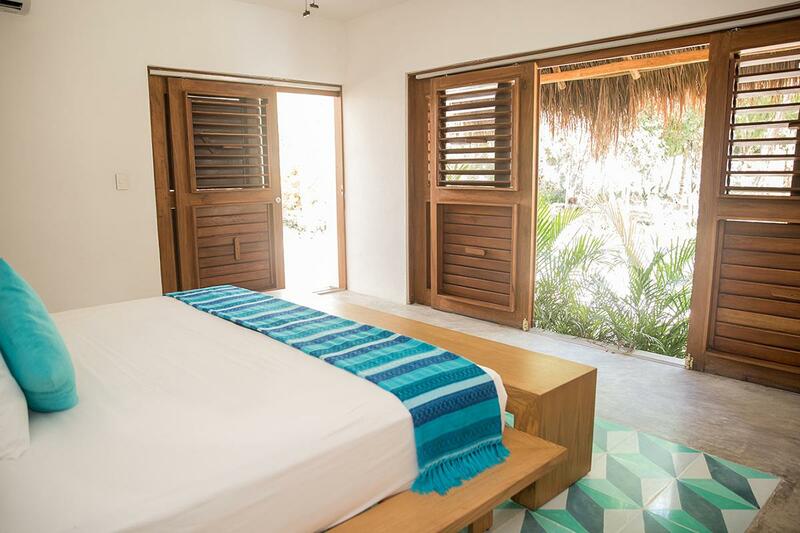 A little tacked away from everything this lovely condo is your home away from home in the beautiful and quaint Tulum . The new apartments offer a comfortable stay with their spacious ambients and fine and minimal finishing. A lovely pool is also there for your relaxation days. Another beautiful new complex for your choice to live like a local. Maramaya house has received a lot of praise from the past guests for the place itself and for the great service provided by the host. Located 5.5 km from Tulum Archeological Site, 1.9 km from Tulum Bus station and free private parking is provided. Of course, they also have an outdoor pool. If you are looking for very cheap accommodation in Tulum you need to look into hostels. In this guide, my fellow blogger Will Hutton will give you some great tips. click here to check it out. Awesome information. You saved us a lot of research. 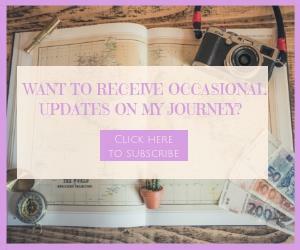 Great blog by the way!